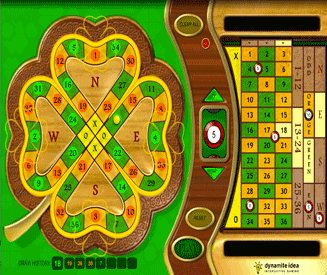 Golden Clover is a mild variant of roulette. In Golden Clover, the ball travels around a clover-shaped "wheel" instead of the normal circular wheel found in standard roulette. 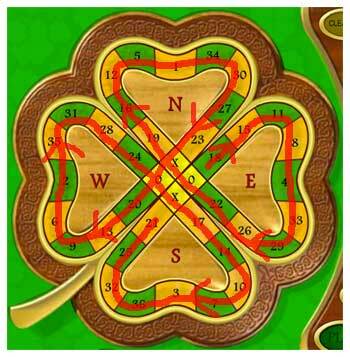 You can bet on the; north, east, south and west sections of the clover. There are 4 yellow segments in place of the single green 0. The numbers are green and orange instead of red and black. Aside from that, most other stuff is the same. 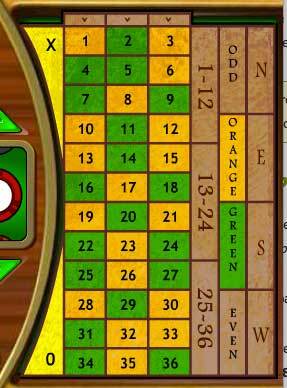 So if you’ve ever played roulette before, you’ll have no problem playing Golden Clover. The problem with Golden Clover though is that it’s just a less entertaining version of standard roulette. It is an intriguing alternative, but it’s ultimately a worse version of the game at the end of the day. Honestly, if you want to try something different, give La Boule or Pinball Roulette a bash. I actually put off writing this review for quite some time, as I knew I wouldn’t have much interesting stuff to talk about. Golden Clover just doesn’t bring anything new or interesting to the world of roulette; it simply changes the shape of the wheel. One of the biggest problems of having a clover for a "wheel" is that a ball isn’t going to travel around it naturally like it would on a circular wheel. Therefore, you’re not even given the slightest impression that the result will be left to the laws of physics. As the ball is forced around the clover, you’re left feeling a little empty in the knowledge that the result is undeniably predetermined. All in all, I think the developers were scraping the bottom of the barrel of imagination with Golden Clover. If you’re a big roulette fan it might be worth having a few "spins" on Golden Clover for funsies, but you certainly won’t be returning after your first (and only) session. Place your bets on the betting area. 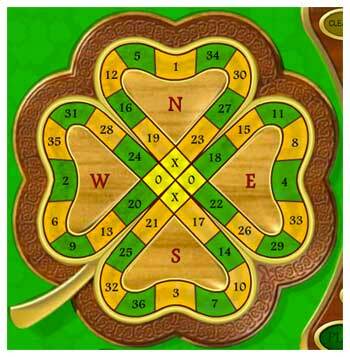 Watch the ball race around the clover wheel and hope that is rests on a winning number/segment. If you know how to play roulette, you know how to play Golden Clover. The Golden Clover "clover" wheel. Similarity: The numbers range from 1 to 36. Difference: The colours are green and orange instead of red and black. Difference: Golden Clover has an extra 4 "wing" bets for; north, east, south and west. Difference: There are 4 central numbers (made up of "X"s and "O"s) in place of the singular "0" found in european roulette. Think of this clover as a racetrack. After placing your bets, the ball travels around the "wheel" in a clockwise direction in each segment. So for example, if the ball starts on the number 18 (in the east section), it will travel around to 22 and through the centre on to number 19 (in the north section) and so on. Note: Despite not being very circular, I’m occasionally going to refer to this clover as a "wheel". I can’t think of a better technical term for it. The ball will continue to race around the clover and its individual segments before finally coming to rest over any of the numbers (or the "X"s or "O"s in the centre). Fact: The ball is equally likely to come to rest on any segment on the clover wheel, even though some segments appear to be bigger/longer than others. The most disappointing aspect of the ball movement is the fact that it doesn’t seem to be controlled by any earthly physics. That’s quite a geeky thing to say if I’m being honest, but this unrealistic movement really takes the excitement and complete unpredictability out of what should be a thrilling casino-based game. Those betting options and payouts. Due to the fact that there are the 4 "X" and "O" segments in place of what would usually be the "0" and "00" numbers on a standard roulette wheel, the payouts are ever so slightly larger for most bets. Colours - 2.3x. Either orange or green. Even or odd - 2.3x. Dozen bets - 3.5x. Bet on sections of 12 numbers across the clover (1 - 12, 13 - 24, 25 - 36). Column - 3.5x. Similar to a "dozen" bet. Bet on a strip of numbers that cover 1/3rd of the clover. Sections/Wings - 4.6x. Bet on north, east, south or west. O or X - 10.5x. Bet on the either 2 of the "O"s or 2 of the "X"s in the centre of the clover. Number bets. These work in exactly the same way as they do in standard roulette. As you can see from this list, many of the betting options in Golden Clover are the same as they are in standard european or american roulette. The biggest difference is the slight increase in payouts, courtesy of the extra "0" numbers if the form of X and O.